Last Scenes of the University Quarter Centennial Celebration. A Brilliant Program Presented by the Students at the Lansing. A Remarkable Success Achieved by the Classical Scholars — Professor Fossler's Able Address — The Alumni Banquet and the Junior Promenade. If Mr. Church has ever doubted the full standing capacity of the Lansing he ought to have very definite knowledge of it now, for yesterday morning it was surely tested to the uttermost. As soon as the doors were open the fortunate possessors of tickets began thronging into the lobby and by half past nine the lower floor and the balcony were filled. When the doors were thrown open to the great unclassified public they were very glad to find a vacant seat corner in the gallery or to get standing room in the aisles. It was easy enough to see that it was a "student's program." The students were there a thousand strong and they brought all the proverbial student enthusiasm and vocal power with them. The yelling began as soon as the house was filled, and when Professor Howard arrived the enthusiasm and excitement grew to fever heat. The boys yelled every known yell and some that were not known — even to the yeller. Some of the students were very patient and persevering in "rushing" a new yell which they desire the university to adopt, but their efforts were met with hissing and the old yell seems to be the one that is dear to the hearts of the students. The Leland Stanford yell was given in honor of Professor Howard and the professor's face flushed with pleasure as he bowed in acknowledgement. An outsider can scarcely understand the altissimo of enthusiasm which Professor Howard's name produces among all university students. Not only do all his old students worship him with zealous loyalty, but the new students who have never been in his classes, who never saw him till Thursday night, have so often heard the ipse dixit , that they seem by a sort of college heredity to have inherited the universal veneration feeling. The professor has left such very great traditions behind him that even to students who have never known him there is a whole dynamo of spiritual force locked up in his very name. The students employed a good deal of the time before the curtain rose in cheering Professor Howard and the chancellor . Indeed, both men are a severe strain on the admiration fund of the university, and when the students had the old love and the new both together and at the same time and all at once, they didn't even try to contain themselves. At last the curtain rose and the exercises began. The musical part of the program was excellent, especially the work of the boys in the university glee club, who sang "The Scarlet and Cream," "The Hunting Chorus" from "Robin Hood" and Jungst's "Spin, Spin" with great spirit and in excellent tempo. The music of the mandolin club was very good, but some of the players were in more of a hurry than the director, which somewhat interfered with the time. The Latin salutatory by Miss Margaret L. Hall met with much merited applause. It was well written and well spoken and her Roman costume added greatly to the effectiveness. The audience especially appreciated the delicate expression and graceful wording of the production and the students admired Miss Hall's marvellous control of the subjunctive mode. The orations were all good and had the inestimable virtue of being brief. The delivery of Messrs. Quaintance and Hatfield was far above the average work of college oration, and Mr. Tucker's oration was really a literary production, which is saying a great deal for an oration. It is impossible to criticise an oration unless one is training for a contest judge, and as the present critic is not, he will dismiss the subject. The Greek and Latin plays were of course the leading features of the program, and as they come nearer within the province of a critic they cannot be dismissed without considerable detail. Mr. Elmore as Hegio was highly satisfactory. He spoke his Latin as easily as if it were his mother tongue and when one remembers the number of lines he had to commit one wonders how he ever did it. Mr. Elmore's Hegio was very, very aged, and was sometimes a trifle too stiff in the joints perhaps, but though not brilliant or showy his acting was of a steady dependable sort that one was not afraid of. Mr. Tucker's Ergasilus was what is technically called a "creation." He seems to have the unreasoning and unreasonable convictions which are necessary for an actor. The common conception of Ergasilus is of a vulgar sponging parasite, very fond of eating and drinking. Mr. Tucker departed from this idea so entirely that at first his presentation rather dazed one. His Ergasilus is a cultured and elegant gentleman with a pitiful and abnormal weakness. He has the same irresistible passion for good viands that a connoisseur has for fine pictures. He loves eating not sordidly, but grandly, with the whole æsthetic and emotional part of his being. When he pleads with Hegio for his dinner one who did not follow the Latin would think he were pleading for his sweetheart. His eloquence is not the eloquence of hunger, but of passion. He is a Romeo of the dinner table. Mr. Tucker's Ergasilus was nearer like Balzac's Cousin Pons than anything else, and his conception is the conception of Plautus himself. It is a type of gastronomic idealization which could only have existed in the Rome of Plautus and the Paris of Balzac, where artificial tastes had reached undisputed exaltation. Mr. John Dixon as Philocrates was a strong and well defined character, and his acting with Tyndarus was especially good. Mr. Dixon's bearing and carriage were fine and he was every inch and every pound a knight. Actors are born after all, and Mr. Abbott seems to have been born. His Tyndarus was the most consistently acted role in the play. His detail was perfect; there was nothing amateurish about him. An amateur gets one conception and hammers away at it ceaselessly, but an actor masquerades his conception in so many varying disguises that it is only on state occasions and in grand climaxes that we are permitted to see it in its naked reality. Mr. Abbott put his conception through all the endless modulations of finished detail, and his Tyndarus went through every stage and degree of fooldom. Mr. Weaver as Aristophontes was spirited and enthusiastic; he was not afraid of himself nor of his part, and his voice and delivery were stirring. Mr. Woods as Philopolemus was seen but little and heard less, and the only thing to be regretted was that he did not appear oftener. His action was absolutely free from ranting and he looked a Roman of the Romans. Mr. Beardsley and Mr. Jones as the slaves were very good fellows indeed, and seemed as contented with their slavery as was the audience. The Greek students opened their part of the program with a chorus from Electra . The music was beautiful and had MR. FLING AS KING KREON. a pathos about it that was not modern: it was the old pitiless fate idea, the ata in musical score. The chorus was a little weak in volume, but sang with great feeling. Miss Martha Burks as the Koryphaios seemed to catch the Greek spirit more than anyone; and although her opportunities for acting were limited she managed to get in some very fine action. When the chorus finished singing the scenery shifted, showing the interior of the palace, with Klytimnestra lying dead, and Aigisthus , Electra and Chrysothemis about her. Miss Grace Morgan's Antigone was truly Greek in carriage, dignity and beauty. Miss Maude Hammond as Ismene was a surprise to her best friends. Not that anyone ever doubted Miss Hammond's success in anything that she might undertake, but it is rather unusual for a classical scholar of her proficiency and thoroughness to blossom into an emotional actress at a month's notice. We generally do not give the classical folks credit for much emotion. In the first place, Miss Hammond had the professional stage voice, which is a thing that very few people possess and which is as odious when manufactured as it is beautiful when natural. Sometimes her voice would sink almost into utter silence, but it was that "silver winged" silence that Sophocles himself wrote about. It had that stirring quality which thrills one and makes one hope they won't cry. Her kneeling at the feet of Kreon was much the prettiest and most touching bit of acting in the play. In spite of the rather modern eyeglasses which, for some unknown cause, she wore, she lived the part she played, and was not ashamed to yield herself up to it entirely. Miss Hammond made Ismene an infinitely grander and more lovable character than Sophocles ever dreamed of making her. It is rather gratuitous to score anyone for acting a part too well, but as one does not often get a chance, perhaps he may be pardoned. If there was any flaw in Miss Hammond's Ismene it was ethical rather than artistic. She made weakness too beautiful. Mr. Fling as Kreon made those who didn't know a word of Greek feel that the play was a tragedy and a great one. His voice was fine and had that deep reserve which of itself seems to herald awful things like those deep passages in Wagner's music. His enunciation was stately and powerful and his pronounciation of those wonderful Greek syllables was enough to turn any classic-weary student back to his first love. His action was strong with that strength which a high conception and complete realization of a part always gives. Mr. James Canfield as the guard was the one touch of comedy in the play, and was a blessed relief from the sorrow and sternness of the other action. In these days a playwright is in luck if he can scrape together enough melancholy to make a tragedy, but Shakespeare and the old Greeks had to dilute their tragedy with a little comedy or they would have killed their audiences outright. Mr. Canefield's comedy was of the highest type; he made a sort of classical touchstone, and his acting was as light and easy as the part demanded. Now and then he put in a touch of the grotesque which strengthened the part greatly. His costume was very ingenious. Mr. Westermann made a very handsome and noble Koryphaios. Remarks upon the merits of the plays themselves seem rather uncalled for and it is equally unnecessary to say whether these plays will "live in literature." Praise is sometimes impertinent, and there are some playwrights whose names should be held like the name the Egyptians feared to utter. It is queer, though, that these plays, whose success is a thing of the ages and whose "run" has been not one of "nights," but of centuries, should happen to come right after such productions as the "Spider and the Fly" and "Fantasma." It makes one wonder if the world has grown quite two thousand years' worth since they were written. The Greek chorus wore the cheton, a long loose flowing garment, without sleeves, over which was draped in various ways the himator, a rectangular garment once by twice the height of the wearer. Their garments were of two colors, the darker being worn over the lighter. In Greek and Latin tragedy the selection of colors sustained definite relations to the interpretation of character. The Greek chorus always dressed in the soft tertiary shades, the primary colors being reserved for the principal characters. In the "Electra" chorus the Coryphaeus alone has the distinction of wearing white, the only trimmings being a gold border in the key pattern. She has two attendants, one in scarlet, the other in pale pink. The chorus of Thebian elders in the next scene were similarly dressed. The Coryphaeus wore a chiton of red over which was draped a magnificent scarlet hunato with an elaborate gold border. He wore a wide gold fillet in his hair. The king wore a chiton of orange bordered with purple and gold, a regal bimeton embroidered in gold. Antigone has a gown of black crepe with a showy Greek border in silver, black being worn as a sign of mourning among the Greeks. Her gown was completed with a peplos or short over garment falling to the waist. Ismene in a lavender gown trimmed with gold also wore a peplos. The attendants of the king wore light pink garments extending to the knees, with sleeves and border of darker material. The guard wore a short buckskin brown traveller's cloak, with helmet greaves and breastplate of bronze. 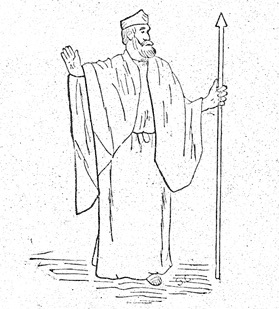 In the Latin play Hegio the father was dressed in white. The slaves wore the customary brown garment, coming to the knees. The parasite, Ergasilus, wore the cast off garments of Philopolemus, and like him wore the scarlet and gold toga. Philocrates wore a pale olive tunic with toga of amethyst. Aristophontus wore a toga of orange trimmed in gold and silver. As a rule the rich man wore scarlet and purple. The slaves always dressed in brown. Only members of the nobility were allowed to wear the primary colors. The costumes were all designed by Miss Ray Manley , manager of the Greek play. University Quarter Centennial Celebration: The University of Nebraska was chartered on February 15, 1869, under the provisions of the Morrill Act of 1862, which helped to fund public universities and agricultural colleges with endowments of public land. 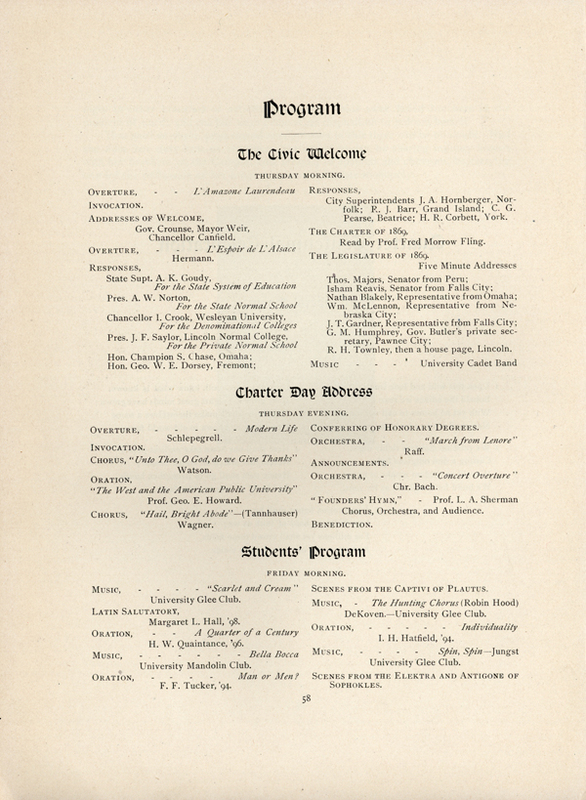 Charter Day was celebrated annually at the university for many years thereafter. The twenty-fifth anniversary of the university's founding, in February 1894, was the first major opportunity to celebrate its accomplishments. As managing editor of the student paper, the Hesperian, Cather was actively involved in the university's celebration. A special edition of the Hesperian contained histories and reminiscences by former professors and students. Classical Scholars: Students in the college of arts and sciences at the University of Nebraska at this time could choose between the classical, the literary, or the scientific divisions. Although there were no specific majors, students could specialize in certain fields by their choice of courses. Professor Fossler: Professor of German Lawrence Fossler (c. 1858-1933) was born in Germany and came to the United States when he was fifteen, settling near Lincoln in the late 1870s. He graduated from the University of Nebraska in 1881, studied for a year in Paris, and, after several years teaching in the public schools, he became instructor and then professor of German at his alma mater. 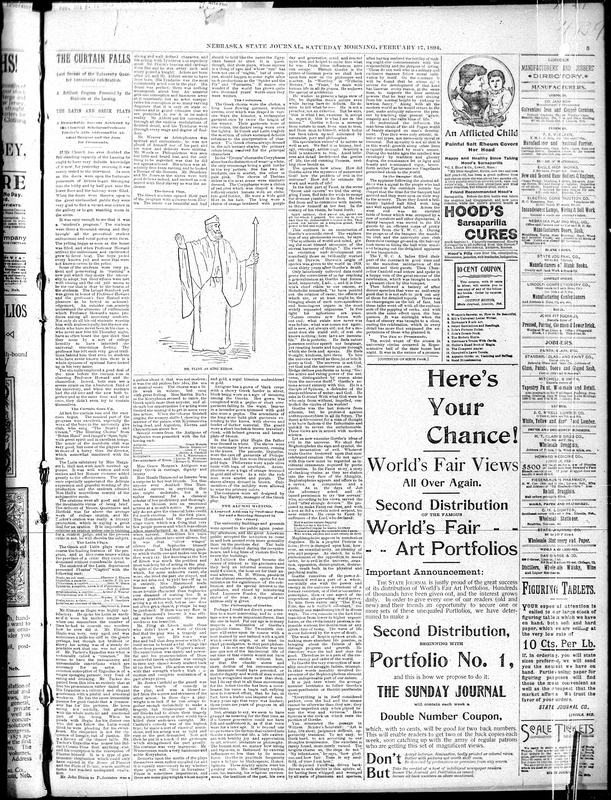 He was a popular teacher: before World War I interrupted the study and teaching of German in Nebraska's public schools, the German department was second only to the English department in size at the University. The Annual Banquet: A banquet attended by the alumni of the University of Nebraska was a feature of Charter Day and graduation celebrations. Alumni were relatively few: until the sudden growth of the university in the 1890s graduating classes in the 1870s had fewer than ten students and those in the 1880s had fewer than thirty. An accompanying story on the alumni banquet reported that 350 people were in attendance, including university personnel and guests. Junior Promenade: Although, or perhaps because, the University of Nebraska was officially non-sectarian, it was closely watched by conservative church people in Lincoln and throughout the state for signs of atheism or immorality. As many influential church people were against dancing, the university did not sponsor dances, and did not allow its facilities to be used for dancing. The students organized dances--although officially a "promenade" was not a dance--on their own. The 1894 Junior Promenade was held in the representatives' chamber of the state capitol building. As a member of the junior class, Cather was on the "prom" committee. Professor Howard: Professor George Elliott Howard (1849-1928) was born in New York state, and moved to Nebraska in 1868. He graduated from the University of Nebraska in 1876, and took his master's degree in 1879, after study in Paris and Germany. He became an instructor in history in 1879, then formed the university's department of history with another distinguished alumnus, Howard Caldwell ('80), in 1883. He married classmate Alice May Frost ('76) in 1880, and worked throughout his career for the educational, political, and economic advancement of women and minorities. In 1891 Howard left Nebraska to become one of the original faculty members at the newly opened Stanford University in Palo Alto, CA; he resigned in protest over a matter of academic freedom in 1901. In 1904 he returned to the University of Nebraska, and organized the department of political science and sociology there in 1906. He became president of the American Sociological Society in 1917. Leland Stanford: After the early death of their son in 1884, Leland Stanford, junior, railroad magnate and Senator Leland Stanford and his wife decided to endow a university in their son's name, to be located on their 8,000 acre ranch in Palo Alto, California. Leland Stanford Junior University opened in 1891, with David Starr Jordan, formerly president of Indiana University, as president; the faculty consisted of fifteen, half of them from Cornell University. Following Senator Stanford's death in 1893, the university suffered financial difficulties while his estate was in probate, but Mrs. Stanford helped to tide it over out of her personal funds. Yell: College yells, usually spelling out the school's name and a slogan or motto, were an important in expressing school spirit and identity. Within a college or university, the students of a particular year would have their class yell, and various organizations would have their own as well. ipse dixit: From Latin, meaning "he himself said"--usually meaning a pronouncement from some authority. chancellor: University of Nebraska Chancellor James Hulme Canfield (1830-1909) came to Nebraska from the University of Kansas, where he was a history professor, in 1891. He was born in Vermont and educated at Williams College. A short, square man of great energy and enthusiasm, he was beloved by the students; he was also a tireless promoter of the university throughout the state, declaring it to be the thirteenth, fourteenth, fifteenth, and sixteenth grades of the public schools. Under Canfield, the university's enrollment tripled in the early1890s and its graduate programs were placed on a firm footing. Canfield left Nebraska for Ohio State University in 1895, and was later head librarian at Columbia University in New York. Canfield and his wife, Flavia, had two children, James A. Canfield (class of 1895) and Dorothy Canfield, later the novelist Dorothy Canfield Fisher, and a friend of Cather. 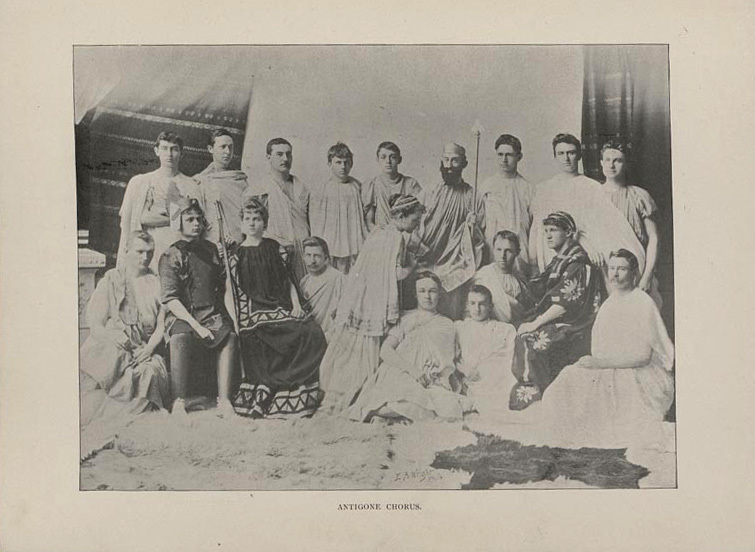 university glee club: The University of Nebraska Glee club, composed only of men, was formed in November 1893; there is no mention of a glee club in the 1892 yearbook, The Sombrero. The 1893-94 glee club consisted of first tenors R.O. Williams, H. S. Evans, J. A. Perkins, and S. H. Martin; second tenors J. 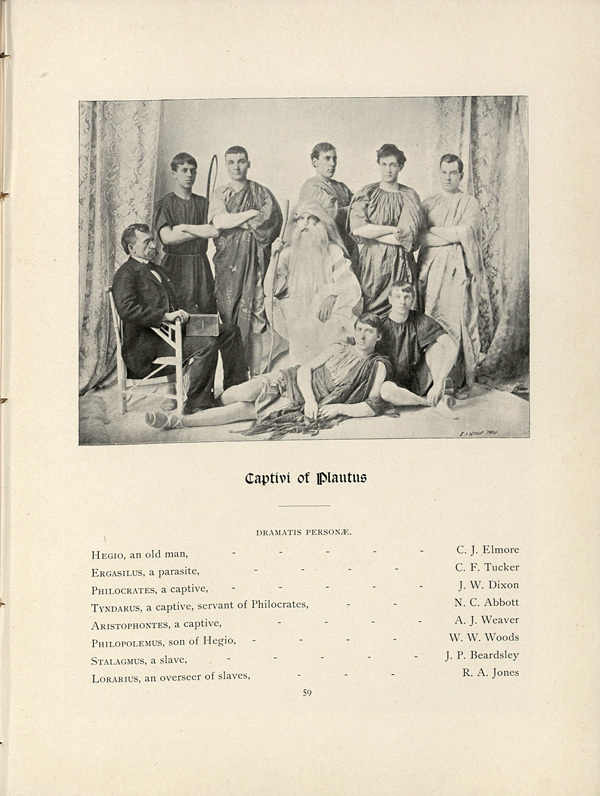 B. Becher, E. C. Willey, H. T. Ricketts, and O. S. Erwen; baritones C. F. Tucker, R. H. Manley, G. N. Porter, and H.A. Reese; and basses R. A. Clapp, E. A. Gerrard, J. C. Jones, H. J. Lehnhoff, and A. B. Ryons. "The Scarlet and Cream": Scarlet and cream became the University of Nebraska’s school colors in the early 1890s. The University of Nebraska Song Book (1921) records the words of the song, with music by Michael William Balfe (1808-1870) arranged for male quartet, as:	Sing to the colors that float in the light,Hurrah for the Scarlet and Cream;Scarlet the hue of the roses so bright,	And pale is the lily’s fair gleam.Scarlet the east at the breaking of dawn,And scarlet the west when the sun is gone,Hail! Hail to the colors that float in the light,Hurrah for the Scarlet and Cream! The Hunting Chorus from Robin Hood: As Act II begins, Allan a Dale, Little John, Will Scarlet, and a chorus of the merry men sing: Oh, cheerily soundeth the hunter's hornIts clarion blast so fine,Through depths of old Sherwood so clearly borne.We hear it at eve and at break of morn,Of Robin Hood's band the sign.A hunting we will go Tra-ra-ra-tra-raWe'll chase the roe Tra-ra-ra-tra-raOh where is band so jollyAs Robin Hood's band in their Lincoln green?Their life is gay,A rollicking life, I ween. Hugo Jüngst: Composer Hugo Jüngst (1853-1923) is best known for arrangements of German and other northern European folk melodies, such as the Christmas carols, "While By My Sheep" and "While Shepherds Watched Their Flocks." "Spin, Spin": Hugo Jüngst's song, "Spin,Spin" (1884), based on a Swedish folk song with English words by Helen D.Tretbar, was one of a genre of music based on the sound of a spinning wheel.The music has come to be associated with the dreidel. mandolin: The mandolin is a small, plucked, stringed instrument, descended from the lute. It has eight strings in four pairs, usually tuned like a violin in G, D, A, and E. The mandolin in use in the nineteenth century usually had a bowl-shaped back formed of strips of wood in the Neapolitan style. Other members of the mandolin family, which were typically played together in mandolin orchestras, are the mandola, which plays a fifth below the mandolin; the octave mandolin, which is tuned an octave below the mandolin; and the mandocello, which is tuned and octave and a fifth below the mandolin. Mandolin orchestras might also use a conventional double bass. Latin salutatory: An address of welcome. The custom of giving such an address (in Latin in the nineteenth and early twentieth centuries) at commencements by the second highest-ranking member of the graduating class gave rise to the term salutatorian' for that person. 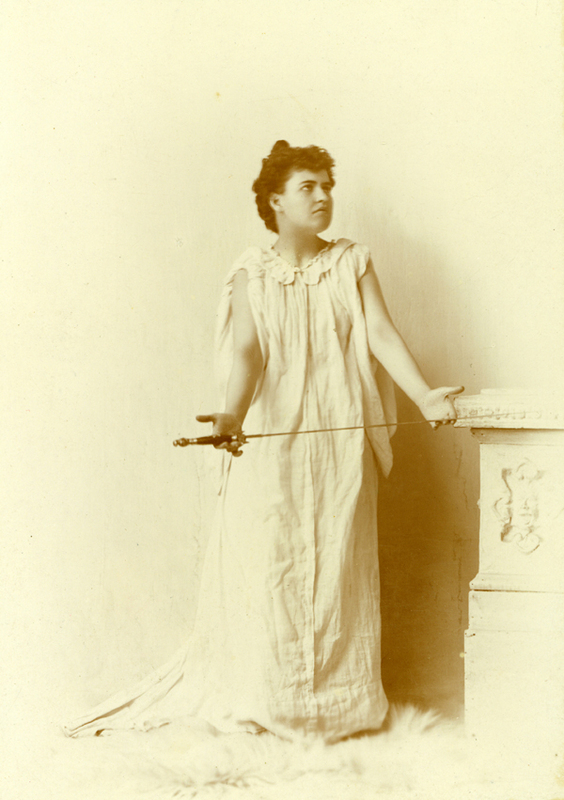 Miss Margaret L. Hall: Margaret Hall did not graduate with any of the University of Nebraska classes of the 1890s. She would presumably have been a member of the class of 1894. Messrs. Quaintance: Hadley (or Harry) W. Quaintance was listed among the Special Students in the 1892 Sombrero yearbook; his name does not appear on later alumni lists. The U.S. census of 1880 shows that he was born in Illinois about 1873. Hatfield: Ira Hamilton Hatfield (LL.B, '94) was a student in the law school. He was born in 1871, son of Jacob C. and Mary Sanders Hatfield; he married Maude Roper soon after his graduation in 1894, and they had one child, Hermine Roper Hatfield (b. 1895). He died before 1936. Hegio: In Plautus' Captivi, Hegio is a wealthy Greek who lost one son years ago when a slave kidnapped the child; his remaining son has been captured as a prisoner of war by the Eleans. Hegio has two Elean slaves, captured as prisoners of war and sent as slaves to Greece. He sends one of them to negotiate the return of his son. Clarence J. Elmore: Clarence Jerome Elmore (1870-1940) took his bachelor's degree in 1895, his master's in 1896 and his Ph.D. degree in 1915 from the University of Nebraska. A botanist, he taught biology at colleges in Grand Island, Nebraska, and Emporia, Kansas, before becoming head of the biology department at William Jewell College in Liberty, Missouri, in 1923. He married Anne Allen (x-'99) of Talmage, Nebraska, in June 1895. Ergasilus: Ergasilus, in Plautus's Captivi, is a stock comic character, the parasite who hangs around a wealthy man in order to be invited to dinner; in return the parasite is expected to be entertaining, often in humorous monologues. Philocrates: Philocrates (the name means "believer in love" in Greek), in Plautus's Captivi, is a young soldier of Elia who has been captured in war and made a slave. He changes places with his own slave, Tyndarus, a young man of his own age, in order to go back to Elia to negotiate the return of Hegio's son, also a prisoner of war. John W. Dixon: John Watson Dixon (d. 1926) took his B.A. in 1894 and his LL.B. in 1896 from the University of Nebraska. He became a lawyer in New York City. Tyndarus: Tyndarus, in Plautus's Captivi, had been sold as a four-year-old to the family of Philocrates, then also four. He is captured along with Philocrates and both become the slaves of Hegio; the two change identities. When Hegio discovers that he has sent the valuable slave, the aristocratic Philocrates, back to Elia, he sends Tyndarus to the slave mines. At the end it is revealed that Tyndarus is Hegio's son, kidnapped when he was a small child. Aristophanes: Aristophontes, in Plautus's Captivi, is one of the Elean prisoners and a friend of Philocrates. Arthur J. Weaver: Arthur J. Weaver, '95, of Falls City, Nebraska, also took a law degree in 1896 and became a lawyer in Falls City. By 1919 he was president of the First National of Falls City, where he still lived in 1936. Philopolemus: Philopolemus, in Plautus's Captivi, is a son of the wealthy Hegio. He has been captured in war by the Eleans, and the plot turns on Hegio's attempts to exchange or ransom him. Warren W. Woods: Warren Willis Woods, '95, took his master's degree from the University of Nebraska in 1904. He was living in the state of Washington in 1936. Stalagamus: Stalagmus, in Plautus's Captivi, is Hegio's slave, the one who kidnapped Hegio's son Tyndarus and sold him into slavery. Joe P. Beardsley: Joe Penfield Beardsley, '95, achieved the rank of captain in the University of Nebraska cadets under Lt. John J. Pershing. He was living in Little Rock, Arkansas, in 1936. Lorarius: Lorarius is a character in Plautus's Captivi. Raymond A. Jones: Raymond A. Jones, though presumably a member of the class of 1894 or 1895, does not appear as a graduate in later alumni directories. Romeo: The name of the hero of Shakespeare's early romantic tragedy, Romeo and Juliet, written c. 1594-95, came to mean a lover. Cousin Pons: In Cousin Pons (1848), a novel by Honor de Balzac, Sylvain Pons, a poor musician who loves beautiful things, slowly accumulates some fine pieces whose monetary value he does not realize. When he falls ill, his cousins, his doctor, the porteress who nurses him, a pawnshop owner, and others all conspire to cheat him out of his things. When he at last realizes what is happening, he tries to circumvent the plot, but fails and dies. All the plotters are rewarded. 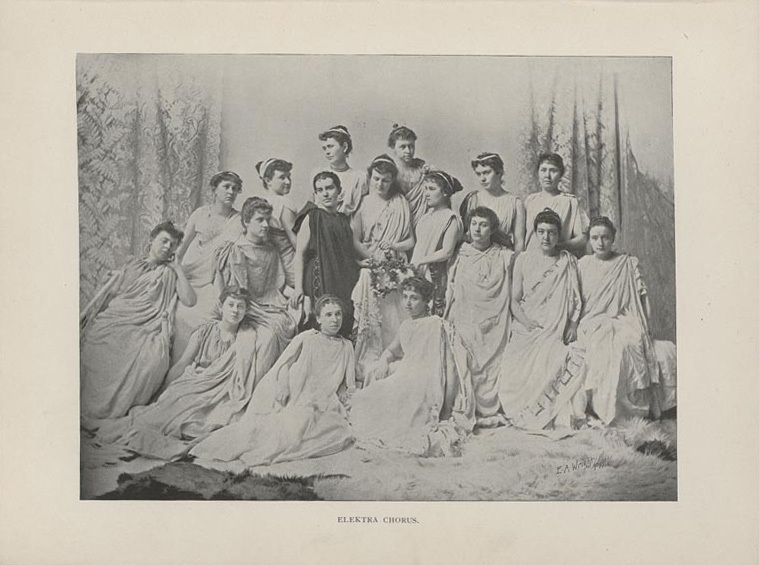 chorus from Electra: The chorus in Sophocles' Electra is composed of the women of Mycenae. Theyhave several notable speeches, in some of which the leader engages in dialogue with Electra.However, the chorus here is probably the last, coming just before Orestes killsClytemnestra—the scene revealed when the chorus is complete. In the play, however, the death scene is not shown. The chorus, in Richard C. Jebb's 1904 prose translation, is as follows: "Behold how Ares moves onward, breathing deadly vengeance, against which none may strive! Even now the pursuers of dark guilt have passed beneath yon roof, the hounds which none may flee. Therefore the vision of my soul shall not long tarry in suspense. The champion of the spirits infernal is ushered with stealthy feet into the house, the ancestral palace of his sire, bearing keen-edged death in his hands; and Hermes, son of Maia, who hath shrouded the guile in darkness, leads him forward, even to the end, and delays no more." Electra: The scene is probably from Sophocles' Electra, rather than that of Euripides' (the subject is also treated in Aeschylus' The Libation Bearers). In the play, Clytemnestra and her lover Aegisthus have murdered her husband, King Agamemnon. Their son Orestes is in exile, then reported dead. Clytemnestra's daughter Electra defies the two and is kept in oppression, while her sister Chrysothemis submits to the new regime. Orestes returns in disguise and is finally recognized by Electra, who is overjoyed. Orestes exacts vengeance on Clytemnestra and Aegisthus and releases Electra. the ata: The ate, as it is transliterated in the Oxford Classical Dictionary, is the aberration, usually inflicted by the gods, that leads to the hero's disastrous actions. Ate is sometimes personified as the daughter of Eris (strife) and sister of Disnomyia (lawlessness), but sometimes is the impersonal punishment for the hero's hubris, or pride. Miss Martha Burks: Martha Frances Burks (1874-1966), ’95, was a member of a sorority as well as Phi Beta Kappa. She taught school for a time after graduation before marrying Lincoln druggist Harry H. Harley in 1896. Koryphaios: In Greek plays, the Koryphaios was the leader of the chorus; he or she usually stood in the center, and sometimes engaged in dialogue with the actors. Klytimnestra: Clytemnestra, the wife of King Agamemnon, murders him along with her lover, Aegisthus. She is also the mother of Electra, Chrysothemis, and her son, Orestes, by whom she is killed. Aigisthus: Aegisthus is the lover of Clytemnestra, who conspires with her to murder her husband, King Agamemnon. He is killed by Electra's brother, Orestes. Electra: Electra is the daughter of King Agamemnon and his wife, Clytemnestra. When Clytemnestra and her lover Aegisthus murder Agamemnon, Electra remains defiant; she is released when her brother Orestes returns to exact vengeance. Chrysothemis: Chrysothemis is Electra's sister, who has submitted to the new order of things following the murder of their father, Agamemnon, in contrast to Electra's defiance. Sophocles: Sophocles (or Sophokles) (496 or 497-406 B.C.) was one of the three great Greek writers of tragedy. He was born near Colonus, near Athens, and was a wrestler in his youth. Of the 123 plays he is said to have written and entered in the contests at the Festival of Dionysius, only seven are known to survive completely. The most famous of these are the three plays of the Oedipus cycle. Sophocles also served Athens as a treasurer, a general, a commissioner, and a priest. Antigone: Antigone, in Sophocles' tragedy of that name, is a daughter of Oedipus; her two brothers, Polynices and Eteocles, were left to share the throne after Oedipus's exile, but were both killed in the ensuing civil strife. Creon, their uncle, decrees that Polynices, as the rebel, should not be buried. Antigone, believing it to be the will of the gods, declares her intention of burying her brother. Creon sends her to a cave to starve to death, but she hangs herself, thereby precipitating also the deaths of her fianc, Creon's son Haemon, and then Haemon's mother. Grace Morgan: Grace Morgan, '95, was in the classical course. She taught briefly after graduation, then married newspaperman Frank T. Riley, '98, who had founded The Nebraskan, the second student newspaper at the University of Nebraska. Morgan was one of Cather's circle of friends, and later wrote how Cather, when she did not have her assignment ready, would entangle their rhetoric professor, Ebenezer Hunt, into arguments that lasted until the bell rang and the students could escape. Maude Hammond: Maude Hammond, '94, was prominent in the social life of the University of Nebraska. She married fellow student Allen C. Fling, but was widowed young. She maintained her interest in the university, and left an endowment for graduate student and faculty fellowships and research travel. Mr. Fling: Allen C. Fling (1871-c.1904) was born in Maine, the youngest of five children of merchant Charles H. Fling. He probably came to Nebraska in 1891 with his elder brother, history professor Fred M. Fling, and enrolled in the class of 1894 at the University of Nebraska. A scholar in the classical course, he taught Greek and Latin at Nebraska City for a time after his graduation. He married classmate Maude Hammond. Guard: A character in Sophocles' Antigone; Creon calls him a "born babbler." James A. Canfield: James A. Canfield, '95, was the son of Chancellor James H. Canfield. He married fellow student Stella Elliott (x-'98), and a few years after graduation started a paper making business in Columbus, Ohio. The Westermann family was the model for the Erlich family in Cather's One of Ours. Will Westermann told James Shiveley that Cather's portrayal was an accurate picture of the atmosphere of their home. Two attendants of Kreon: As king, Creon would have had courtiers, guards, or other attendants. Lucius W. Sherman: Lucius W. Sherman was the son of Lucius A. Sherman, English professor at the University of Nebraska. Though presumably a member of the class of 1894 or 1895, he is not listed in the alumni directories as having graduated from Nebraska. Horace G. Whitmore: Horace Greeley Whitmore (d. 1945), '95, was active in student life, and was one of the founding members of the Delta Tau Delta fraternity at Nebraska. He became a lawyer and a prominent citizen of Minneapolis. "silver winged" silence: Liddell and Scott's Greek English Lexicon (London: Oxford UP ) does not list this phrase as used by Sophocles or other Greek writers; it may be a translator's elaboration. the name the Egyptians feared to utter: The Egyptian god Set (or Seth) was the god of evil and chaos, associated with the desert and infertility. He killed his brother Osiris, the beneficent god who taught the Egyptians how to farm. chiton: The Greek chiton was, as Cather describes, a loose, sleeveless garment, the fundamental article of clothing to which other pieces were added. himator: Cather may mean the himation, a rectangular length of wool or linen, worn draped over the chiton and held in place by the hand. The chiton and the himation were the main garments worn by men. The himations worn by women could be elaborately decorated, while those of men were plain. 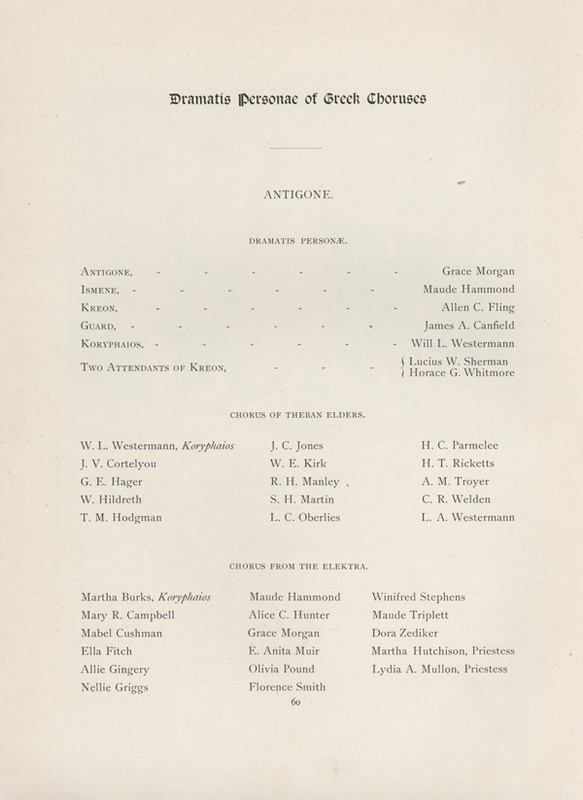 chorus of Theban elders: The chorus in Sophocles' Antigone is composed of the elders of the city of Thebes. hunato: This word, as transliterated by Cather, has not been found in dictionaries of ancient Greek. Cather may mean the himation, a rectangular length of wool or linen, worn draped over the chiton and held in place by the hand. The chiton and the himation were the main garments worn by men. The himatons worn by women could be elaborately decorated, while those of men were plain. bimeton: This word, as transliterated by Cather, has not been found in dictionaries of ancient Greek. Cather may mean the himaton, a rectangular length of wool or linen, worn draped over the chiton and held in place by the hand. The chiton and the himaton were the main garments worn by men. The himatons worn by women could be elaborately decorated, while those of men were plain. peplos: The Oxford English Dictionary defines the peplos as a large rectangular length of fabric, draped over the shoulders and falling to the waist, where it was belted (or later, belted under the bust). Miss Ray Manley: Rachel E. Manley, '90, was born in Ohio about 1868. After graduation she became an instructor at the University of Nebraska, and was very popular with the students. She later married Raffe Emerson of Chicago, and was living in Omaha in the 1930s.